It is remarkable how many of us spend our lives focusing on the wrong things. A company we came across recently is busy tripling its graduate intake as a result of losing too many staff with two and three years’ service. You have to ask why they are not focusing money and effort on retention and getting to the root cause of why staff choose not to stay very long. Tripling your intake is unlikely to solve the problem. Is there anything going on in your own business that people already know will not actually solve the problem at hand? There has also been plenty of research into how long you hold onto those employees who you talk down from resigning by offering more money. Problem solved you might say, but ask a few questions and you’ll find that most of those employees ultimately leave within 12 months of getting their lovely pay rise. No surprises that it’s not always about money. In fact, it’s often not about money at all. But let’s look at the much bigger picture here. Are you aware that experts have predicted that 50% of current occupations will not exist by 2030? Does that include your own occupation do you think? If so, what are you going to be doing instead, assuming you are not aged 57 or above and so hopefully will be enjoying your retirement? Now take a look around your business and see if you can identify which 50% of occupations will be gone in just over 10 years. Once you’ve done that, assuming you want to retain good staff and attract in more good staff, what projects do you need to have in the planning now to adapt and change as you will inevitably have to if you wish to continue operating after many traditional roles have disappeared? In 2017 an estimated 1.8M of the working population was employed on a zero hours contract. By 2030 traditional employment may well be a thing of the past. How is your business model changing and what are you putting in place to ensure that you will be able to draw from a talent pool who prefer to work with your rather than your competitors. If you no longer need to train people as you no longer employ them, who exactly is going to be training the millions who will be self-employed? What big ticket changes are needed to your IT and infrastructure to manage people who no longer are in your employment, whose place of work is variable, whose hours of work are not predictable or guaranteed? An Italian 3D printer company named WASP, demonstrated a giant, three-armed printer filled with mud and fiber to build extremely cheap houses in some of the most remote places on Earth. By 2030 this will be the norm in the construction industry. Do construction firms have sufficient numbers of tech savvy employees to ensure they stay competitive in this changing market. What occupations will all those displaced workers go into? Who is going to retrain them? Who is going to be responsible for the mental health issues that arise when people lose their jobs with no prospect of re-employment elsewhere? Construction aside, robots taking jobs from manufacturing workers has been happening for decades. But rapidly advancing software will spread the threat of job-killing automation to nearly every occupation. Who in your IT team and on your Board of Directors is going to lead this drive into automation? Who are your automation champions? If you outsource IT if you are a smaller business, who is going to give you the knowledge and skills you need to remain competitive? If your outsourced provision is reactive only, that might kill your business. How many outsourced IT functions are as proactive as they need to be to keep business owners in the loop? What do we do with all those people who continually say ‘I’m no good with technology’. It’s a massive problem and we have got to the point where we have to start dealing with it as we need those people in our businesses but we need them tech savvy and tech confident too. Kristian Hammond, CTO of Narrative Sciences predicts, “by 2030, 90% of all the news will be written by computers”. How can organizations ensure good employee relations, that will drive good retention, when so much is automated – even day to day communications? What checks and balances need to be put in place to ensure people feel they are being treated as ‘humans’? 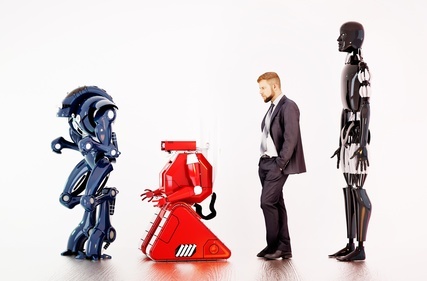 Have you calculated the upside and downside of AI and business automation? What are your challenges, but equally what are your opportunities? If you don’t work this out now, we’ll be hitting 2030 and your business will have been left way behind the competition. Individuals will be working for companies whose values fit their own and businesses will employee those with values similar to theirs. How do you maintain values and culture when so much is automated? Do you have a culture and value set that is distinguishable from your competitors? If you don’t, you may find you lose out when trying to recruit and retain staff. Standing out is going to be all important? What directors do you have on your board who are going to confidently drive this? Any skills gaps obvious? Flying drones will be configured into thousands of different forms, shapes, and sizes. They can be low flying, high flying, tiny or huge, silent or noisy, super-visible or totally invisible – we anticipate that this will replace a lot of delivery and also warehouse services. Amazon has been long criticized for its treatment of its workers, but what will happen to the workforce when drones do the fetching and carrying in warehouses and when drones also do the deliveries? In no time at all Amazon could be a company with only a few staff, leaving tons of people out of a job and no alternative jobs to go to. What are the consequences for our society and jobs markets? How can we prepare? “A growing proportion of jobs in the future will require creative intelligence, social intelligence and the ability to leverage artificial intelligence. And for most people that will be a route to happiness and fulfilment” Genesis/CBRE researchers. But what if it’s not the route to happiness and fulfillment? And what of those who read this and say ‘what about me as those are not my natural strengths or skill set’? What do we do with the people who no longer quite fit? There will be millions of them? We have to find a way to ensure they remain engaged and appropriately skilled. Are tech savvy experts driving us to a culture that many will come to hate and resent? Its long been proven that promises of social media expanding our network of friends and giving us more satisfaction in life is by and large a load of rot given the often serious, unintended consequences of our online activities. GM or recombinant farmer: That’s “GM” as in “genetically modified” or engineered crops and livestock. Elderly wellness consultant: As an aging population increases in size, we’ll need folks to tend to their physical and mental needs. Memory augmentation surgeon: Like Eternal Sunshine of the Spotless Mind, surgeons could boost patients’ memory when it hits capacity. ‘New science’ ethicist: With the rise of cloning and other ethically-dubious practices, ethicists will be needed to ford the river of progress. Virtual lawyer: As international law grows to supersede national law, lawyers will be needed to handle cases that involve people living in several nations with different laws. Any of these take your fancy? And is it just us, or are we struggling to find any real people focussed jobs amongst this list other than wellness consultants and branding managers? Love to hear which of these jobs you would choose and why! Jaluch has nearly two decades of experience in the HR and Training Sector. Let us support your managers as they acclimatise to a world of constant innovation and change, let us give your worried staff more tech skills so they feel less left out and let us work with your directors to ensure clarity around values and culture. 60% of Jaluch’s revenue is derived from supporting our clients with grievances, disciplinaries, dismissals, redundancy consultation and day to day HR challenges. This makes us uniquely placed as a business to talk about what can be done to improve manager confidence, to reduce internal disputes and to address cultural issues that so often impact job satisfaction and retention levels. All of which impact organisational success and business profitability.